EURUSD – A Brave, New Uptrend? It seems that the euro may have finally found a bottom (actually, a DOUBLE bottom) around 1.2359. From this clearly-significant low, the euro advanced for 170 pips. Will this be the beginning of a new uptrend that’s going to last for weeks, perhaps even months? Or is this just a temporary pause before the downtrend resumes its movement even lower? Elliott Wave chart analysis for the EURUSD for 28th November, 2014. Please click on the charts below to enlarge. The bigger picture sees the euro moving downwards in primary wave E, which is the final subdivision in the contracting triangle of cycle wave x. Primary wave E is most likely unfolding as a zigzag labeled intermediate waves (A), (B) and (C). Intermediate wave (A) unfolded as an impulse labeled minor waves 1 through 5. Minor wave 5 formed an impulse labeled minute waves i through v.
Minute wave iii formed an impulse labeled minuette waves (i) through (v) and reached exactly 261.8% the length of minute wave i. Minute wave iv formed a double zigzag labeled minuette waves (w), (x) and (y), retracing exactly 50% of minute wave iii. Minute wave v formed an impulse, pushing minor wave 5 to reach 100% the length of minor wave 1, and most likely completing intermediate wave (A). Intermediate wave (B) is probably unfolding as a zigzag labeled minor waves A, B and C.
Minor wave A is forming an impulse labeled minute waves i through v.
Minute wave i is itself forming an impulse labeled minuette waves (i) through (v), within which minuette waves (i) and (ii) are most likely complete. 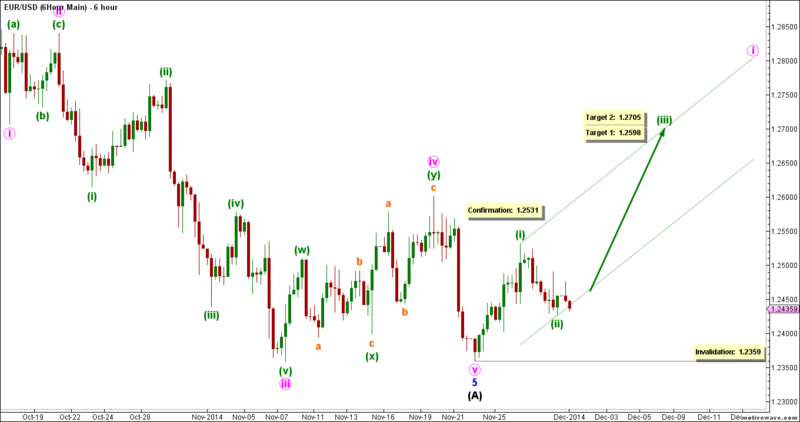 This count expects the euro to continue moving towards the upside in minuette wave (iii). This will be confirmed by movement above 1.2531. The MACD indicator somewhat supports this count by showing bullish divergences with consistently increasing momentum. At 1.2598 minuette wave (iii) would reach 100% the length of minuette wave (i), then at 1.2705 it would reach 161.8% of its length. This wave count is invalidated by movement below 1.2359 as minuette wave (ii) may not move beyond the start of minuette wave (i). This count sees that minute wave v is still unfolding towards the downside, most likely as an impulse labeled minuette waves (i) through (v), within which minuette waves (i) and (ii) are most likely complete. 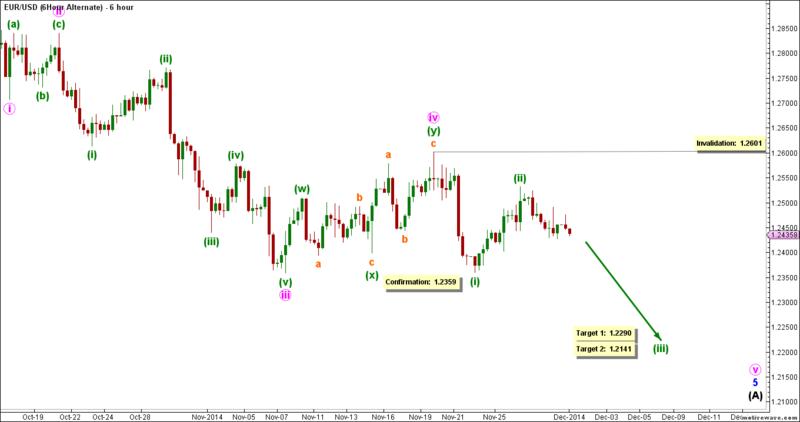 This count expects the euro to continue moving towards the downside in minuette wave (iii). This will be confirmed by movement below 1.2359. At 1.2290 minuette wave (iii) would reach 100% the length of minuette wave (i), then at 1.2141 it would reach 161.8% of its length. This wave count is invalidated by movement above 1.2601 as minuette wave (ii) may not move beyond the start of minuette wave (i).